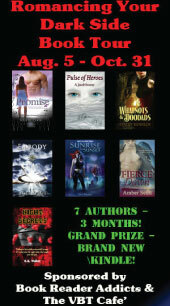 Cate: Amber Scott’s up next in the Romancing Your Dark Side Author Tour. Please give Amber a warm welcome!. Amber, will you please share a short bio with us? Amber: In between naptimes and dishes, I escape into the addictive twists and turns of my characters’ lives. I often burn dinner, am a sucker for chocolate and still believe in happily ever after. I’m married with two kiddos and live in sunny Arizona. I want a cat. Badly. One day, my husband will get me many. Cate: Tell us about Fierce Dawn and where it's available. Amber: Fierce Dawn is book I in the ParaRealm series and reveals a human who is becoming a changeling. Not fully immortal but no longer human. She is key to unraveling a conspiracy against all humankind. Amber: Snarling teeth, glowing eyes. Someone--something--is after her. The man who haunts her dreams enters her reality, claiming she's transforming into a changeling--not quite immortal but no longer human. Except nobody wants this change. Not humans, not immortals and least of all her. Cate: Love it! Can you tell us why we're going to love your hero? Amber: Elijah’s power is magnetism so in truth it is difficult for anyone to resist him. But he hates to exploit others so rarely uses the power. He’s honorable and hellbent to right wrongs and my favorite thing about him, he accepts and loves Sadie just the way she is. Amber: In this world human blood is a drug and any immortal addicted to it is a vampire. So that means shifters, seekers, feeders or any elemental can succumb to vampirism. Humans are evolving into changelings and that is causing two previously separated realms, the human and immortal, to collide. Amber: I’d always wanted to be an author but never actually had tried to be one. So when my son was born and I became a stay home mom with a couple hours a day of downtime, I realized, if not now, when? So I gave myself my own NaNoWriMo and finished a very terrible novel in a month. I found I not only dreamed of being an author but I also LOVE to write. Phew! Cate: It’s an addiction, for sure! Do you have a writing routine? Amber: I used to back when my son was an infant and a strict scheduled napper. Then my daughter came along and I learned to write on the fly. Literally. I wrote Play Fling with the two of them hanging from each leg, me, standing typing on my laptop at the breakfast bar, my pajama pants often yanked to my ankles. This taught me how to keep the story going in my head plus how to sneak in a little at a time. Cate: That’s perseverance! lol Where can readers find you on the web? Amber: What three things in a hero tend to make you swoon? Cate: Readers, Amber is giving away Fierce Dawn to a random commenter... so start commenting. She'll pick a winner on Sunday, September 25 and announce the winner on this post. Thanks for being my guest, Amber! Best of luck to you. And don’t forget to visit again tomorrow, when the Romancing Your Dark Side Tour continues! Welcome Amber! Love that gorgeous cover - wow. Thanks, Cate! Elijah is seriously delish on the cover, eh? Elijah is seriously hot!! I really enjoyed this book Amber and I can't thank you enough for writing it. It totally rocked!! Does Lyric get his own book?